Businesses, small and large are using social media to push their brand and reach their target audience which largely includes the millennials. With millions of active users, social media has become a staple to myriads of the digitally savvy. Most companies are fascinated how upcoming social media platforms are being adopted by the users who are looking for quick interaction with a brand. Some of the platforms that started just a couple of years ago are now turning into norms for most of the largest digital firms owing to the multifarious activities and features provided by them. With 100 million plus active users, the image messaging multimedia app is also used for brand networking by the companies. The features of the app such as Discover and Stories are widely being used by General Electric (GE), Coca-Cola, CNN, etc for connecting to their customers. Snapchat is preferred by the companies for creating brand awareness and to encourage interactions from their followers. American fast-food chain, Taco Bell has been shattering Snapchat records since launching its Cinco de Mayo Snapchat Lens campaign. It received 224 million views in one day. In the past, World Wildlife Fund (WWF) started #LastSelfie Snapchat campaign for raising awareness about endangered species. A six-second video sharing app, Vine attracted myriad users including comedians and musicians and has revolutionized the ways brands connect to their customers. Brands such as Dunkin’ Donuts, Gap, Samsung, Target, Disney and Oreo are famous for their stunning six-second-loop videos. Vine marketing is now widely being used by many companies to visually promote their brands. Vine can help a brand in creating a brand story and showcase the brand personality through the allotted six seconds. Whether tutorials, comics or stop motion; vines gain more views as they are more easily shareable due to their short duration. Shots Commonly known as the comedy app, Shots is used to share funny links along with selfies and videos that are displayed on a feed. It has now emerged as a full-fledged social network that can be leveraged by various brands. Popular celebrities like singer Justin Bieber and boxer Floyd Mayweather increased their social media presence through shots. Got a TVC that’s coming out? Why not share the teaser on shots and let it brew? Different needs, different social medias, that’s how the internet rolls these days. Periscope is a live video streaming app that has gained a ton of traction within a short span of time. Brands have come up with innovative videos to earn new followers and grow their business. Owing to the quality of the app, the users are able to forge personal relations with its customers. Periscope can help in brand-building activities such as interactive customer support, product demonstrations, sharing customer feedback, breaking news and even an overview of brand history. All of which are being utilized by Red Bull, Doritos, Adidas, GE, Pizza Hut and many more. Last year, British luxury fashion house, Burberry premiered on the app with a live broadcast of its show in Los Angeles. Periscope is a great way to introduce a new product and receive customer feedback and questions almost immediately. Without a doubt, this can take customer relations of a brand to the next level. With about 90% female members, Wanelo app is a digital mall with millions of products including a host of big brands that enables you to follow and share products with other people on the app. 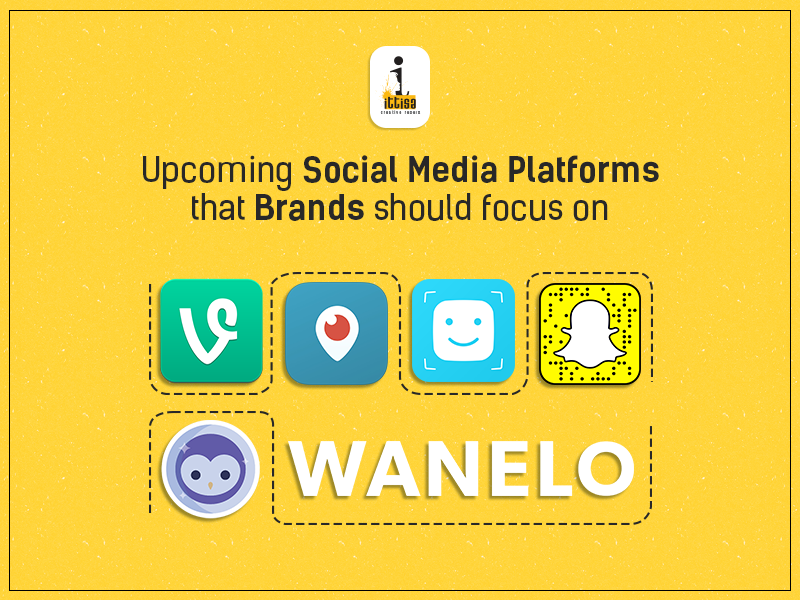 Many brands are managing their e-commerce presence on Wanelo for increasing traffic and conversion rates. 100% advertisements free, it is a social media marketplace for more than 3.5 lac stores and 20 million plus products. Addicted to online shopping? Then this shopping community is a must to be part of. Some of the brands that have stores on Wanelo are Katie Joelle, Kody, Opal Apparel, Kalypso and much more. Real-time video streaming has become quite popular among brands. Blab, with an easy-to-use and engaging interface, is an interactive app that facilitates group discussions. Periscope and Blab are similar, yet different in some key aspects. The former permits 1 host per each video broadcast. This is called a “scope”. Whereas, Blab allows 2 to 4 hosts for each broadcast. In Periscope, the scopes are available for replay only for 24 hours, whereas in Blab there is no time limit. Depending on the requirement, the companies can decide which platform is best for their business. The social media triumphs of many brands are proving as a catalyst in expanding their online brand presence and outreach as well as increasing online sales. Social media monitoring has improved exponentially in order to promote, strengthen or defend a product or brand on social media sites. Most of the companies are applying 360-degree approach for having a huge presence on social media platforms. It’s clear that most of these social media channels are interactive platforms that are fitting for today’s fleeting attention spans. They’re also very hands-on platforms that need to be tended to on a daily basis, this kind of interaction will almost definitely help in humanizing the brands like never before. Therefore, it is high time brands start leveraging this platform for their own benefit.